If you've started to notice a musty smell inside your home, or somewhat of a stale quality about your indoor air, professional air duct cleaning is one of the best ways to eliminate this. Even if you are very particular about replacing your air duct filters in the proper amount of time, there are still particles of dirt and debris which can accumulate inside your ductwork system. This can provide an excellent breeding ground for mold, mildew, and bacteria to prosper, which will contaminate your home's atmosphere and could potentially lead to respiratory difficulties, especially among allergy sufferers or asthmatics. Thorough cleaning will remove – or at the very least greatly reduce – these contaminants, and will allow a greater flow of clean air into your home. Regular cleaning will also improve your system's capability, which will lead to a lower electricity bill. Because your HVAC unit won't have to strain when trying to move air through clogged filters and dirty air ducts, it will perform much more efficiently and will require less energy in order to do so. Aside from saving you money, this will also greatly reduce the system's risk of a malfunction. 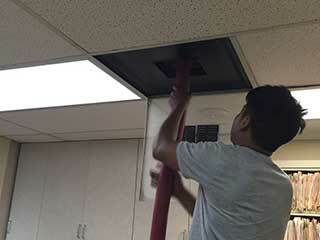 As we mentioned above, one of the direct results of regular air duct cleaning is that your system will perform more effectively and will be less likely to suffer from various operational issues. This in itself offers an added benefit. It will significantly increase the lifespan of your HVAC system, saving you money on emergency repairs and replacement parts. Since cleaning only needs to be done approximately every six months to a year or so, the cost of cleaning can easily be recouped. Not only will your indoor air smell better, it will actually feel cleaner. The musty and stale odors that can plague your home have a way of making the indoor environment feel extremely stuffy. If you have taken the trouble to keep your carpets clean and are making sure to maintain proper housekeeping habits, yet you still struggle with smells which can only be masked by candles and air fresheners, then professional air duct cleaning is more than likely the solution you've been looking for. Make sure to contact our experts at Air Duct Cleaning Calabasas to enjoy all of these benefits and more.